Well done getting a drum made! If you make any more though, you might find it much easier to do things in a different order. I've tanned quite a few so here are some suggestions, obviously feel free to ignore everything, we all have our own ways of working. Firstly a salted hide will keep unfrozen for ages, if it has been salted, drained, and salted again it will keep literally for years, so no urgency getting things done or frozen. If you get a fresh hide from somewhere and don't have room to freeze it, smother the inside with salt, this will bring out the moisture. Give it 24 hours, scrape off the damp salt and allow any liquid to drain, add more salt, fold flesh side to flesh side, roll up, put in a bag, and it will keep for months at room temperature. Generally it is better to clean the flesh side before trying to remove the hair or wetting the skin in any way. After salting the membrane and meat become dry and a bit less glued to the skin and therefore a lot easier to remove, so scrape it all off, along with any clinging salt, before soaking the hide in anything. If you leave the meat and membrane on the hide and soak it, there is a chance it will go extremely foul and stinky by the time the hair has slipped. Once the skin is scraped then rinse it out to get any blood or salt out, then proceed with hair removal. Wood ash is good to soak hides in, builder's lime will also work, but hides can also simply be soaked in clean water until the hair slips, changing the water every day will prevent stinkiness. If you've used lime or enough wood ash however there is no need to change the water as the solution is anti bacterial. Lime or wood ash are good to use if you are further tanning to leather or buckskin, but water alone is fine for drums and you probably end up with a better skin with just water. I tend to start at the top when stretching- the hide on the neck is the thickest part and easily strong enough to hold the weight of the hide, so I generally put a hook through the centre of the neck and hang this from the top centre of my frame, this way the hide is off the ground and its easy to work your way around the hide. I sometimes put a temporary fixing at the bottom too. I work both left and right around the hide simultaneously so that I can add tension as I go, this way there is less pulling through of the string later. I'll certainly try scraping the flesh side before washing. Fortunately the guys at Bradgate Park did a pretty good job of cleaning the flesh side, which made life easier. For de-furring, wood ash seems to work pretty well and I'm assuming it does the job quicker than water on its own? 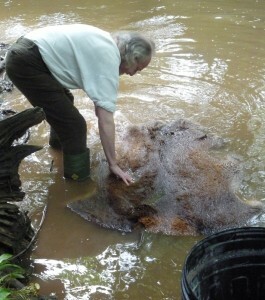 I know Native American folk used to weight down hides in running water for a couple of weeks to de-fur. Did not know that still water, changed daily, would produce the same result. There is a brook that runs past my house but it's crossed by bridges and followed by footpaths so unfortunately I can't leave hides in it, though it is a great source for water for soaking and washing. With the second skin, I started from the top, partly because there happened to be a very neatly placed hole I could use to make the first tie. Like you, I used that tie to hold the rest of the hide off the ground and worked around the hide in much the way you suggest, including putting a couple of temporary ties at the bottom. I usually use just water, it is a little more tricky as you have to change the water and check for slipping. Lime is so easy, chuck the hides in and forget about them as they don't rot in a saturated lime solution. The amount of time really varies in water according to the ambient temperature- from up to a month to as little as four days. In Scandinavia they leave hides weighed down in a lake for the whole winter to slip the hair! The most awkward thing that can happen with water is that the hair often doesn't slip along the spine fast enough, so that the edges of the hide are starting to weaken by the time the hair on the neck is easy to scrape, especially with old stags. It also tends to smell a little in still water, though the smell goes away in the wind by the time the hide is dry, or by a week or two after if the hide is stored somewhere airy. 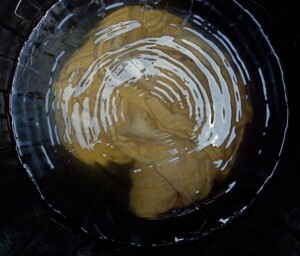 However the natural oil remains in the hide with this method which makes for a better drum, and the skin isn't bleached at all by lye or made chalky by lime. Glad your hides were reasonably clean, sometimes they are very time consuming depending on who skinned them, and on the animal. Cow hides are particularly difficult as they hang onto their fat and are very heavy. I have ten to tan to rawhide in a stillage in the garden, deep joy! They are each too heavy for one person to lift, but most of that weight is attached meat and fat. If you do a lot of hides you might like to invest in bungee cord and market clips (like strong crocodile clips), then you just clip the hide to the frame with lots of separate bungees that are attached to the frame at intervals. This is the way it is done commercially. I've never used this method myself but it must be many times faster than lacing. Thank you both Greywolf and Corwen for your tips. I have been wanting to make my own drum for a few years now, wondering where I might get a skin- I didn't fancy one from a shot deer, even though there is such waste of all the skins from the venison market. Then today, bizarrely I found a dead roe deer in the field by my house. She looks like she might have just dropped dead while nibbling on grass... no wounds... Anyway, I have strung her in the tree outside and will skin her tomorrow. (not going to eat any of the meat just in case...) I am curious about your method of just using water to slip the hair. We have a burn running at the bottom of the field so it is possible I could weigh the skin at the bottom and attach it to the root of an alder tree. (Maybe I should leave the farmer a note!) The winter has been remarkably mild up here in Scotland. Do you think I could leave the skin in the running water for a week or two or should I salt it and then wood ash & slake lime? 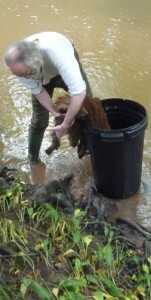 Is it important to get it soaked pretty swiftly after skinning or can it wait a day? My pal has made a drum before and she says wood ash and slaked lime works best but I am quite drawn to just allowing the running water to do the work so that I can have time to go and steam bend an ash frame. I also don't have any slaked lime... Never skinned a deer before- only helped with a sheep once, a long time ago! got a friend who can help if I need. Some seriously cosmic things been happening recently. Can't believe a deer has now offered herself up for a drum for me! Don't want to mess it up!! Any advice on tanning greatly appreciated. Thank you! Sorry this reply was a long time coming. Have you had any luck with the hide? Not having access to a stream that doesn't have a footpath running alongside it, I haven't tried the running water method, though I'm told it has been used by various indigenous peoples since time immemorial, so I guess it works and would be interested to know how you got on. Sorry I too have only just seen your reply!! 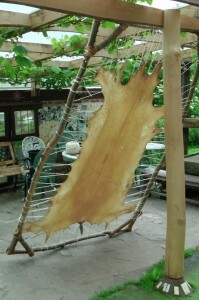 After skinning the hide I salted it until I had some time to work on it. After about 3 weeks the hair just started to fall out so I spent an afternoon plucking as much as I could from the skin and then left it in the burn for a week to slip the remaining hair. This method seemed to work well but I really hope I didn't scrape too much of the skin off initially. I thought I was removing unwanted fascia but it is now quite thin. Still strong though. I left it to dry on the washing line and am only soaking it now to see how big to make the frame. I was wondering why you stretched out your skin on the square frame before putting it on the drum frame? Is that important? I was just going to resoak the skin and stretch it over the frame. what did you use for stringing it? Just excess skin? I only just learnt about backstrap as a good material. I am off to source some ash to make the frame today- do you bend yours around something circular or do you allow it to bend into whatever shape it wants? Thanks for replying before! Sorry i only just saw it!! Wow! great discussion. A+ to your process Greywolf! and wonderful reply from Corwen, your suggestions are also appreciated from me. I don't process a lot of hides (yet! :) but the use of bungee cords for hide stretching sounds fantastic. Hi great discussion picked up loads of helpful tips, but please can any one tell me how to do a deer hide and leave the hair on, two reasons for this one i want to make a drum with hair on. and i would also like to make a rug with another, so far all my reading tells me how to remove hair which i find is really easy with lime solution, but surely if i just dry it to rawhide after i have fleshed it , it will smell and rot? also my reading leads me to understand that you don't use a tanned hide to make drums. I also don't want to be using brains as i have the hide and not the whole animal and i don't want to be using chemicals as all my waste needs to go on the land. Hope this makes sense and someone can offer me a solution. Thanks for getting back kind of you to take the time and do some research. I think maybe i know the answer tanned hide is no good for making drums and to make rawhide with hair on you just flesh and dry, i was trying not to have to go through tanning to make a rug, but i think left as rawhide it would be to stiff for a rug. so i will have a go at rawhide hair on for a drum. Can you help. I have a horse hide and it is still fairly smelly. What can I do to get rid of the smell before drum making. The hide is dry. I'd suggest that when you re-soak it to make the drum, you add about a third of a cupful of white vinegar to the water. This is a very helpful drum making 'how to'! 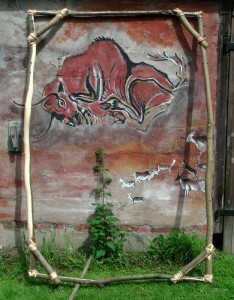 I am wanting to make a large shaman frame drum for an exhibition in France. Ideally it would be 2m in diameter or more. Do you make drums for order or would be able to put me in contact with someone who may be interested and have access to large skins? I would appreciate any valued information you could give me. I do sometimes make drums for people. A 2m drum would require a very big hide. I work with Red deer hides and the largest drum I could make with the biggest hides I could get would be around 1.5m diameter maximum - they're never exactly circular, so may be little less than that in width. To get a bigger drum, you'd need someone who works with bull-hide. I don't know anyone who does. Maybe try one of the shaman facebook pages? Shaman portal? I had the same problem. Plenty of places online tell you how to put the skin on a drum, no one says much about making the hoops. I worked out a way by trial and error, which I think is explained in the blogs. As for types of hide to use, that depends. Buffalo hide is thicker than deer hide and will therefore give you a deeper, more bassy sound. It'll make a heavier drum though, and the sound of the drum also varies depending on the size and depth of the hoop you use. The bigger the surface area of the drum and the deeper the hoop, the deeper and bassier the sound of the drum. Using buffalo hide means you can get the same depth of tone using a smaller hoop than if you use deer hide. I base my choice of Red Deer hide on the fact that I feel an affinity with Red Deer more than any other member of the deer clan or any cattle/bovines. Bearing in mind that a spirit drum will 'host' the spirit of the animal whose skin you use, do you feel more drawn to working with the spirit of Deer or Buffalo? I am looking for a new source of natural hide to make drum skins, and I wonder if you may be able to offer any help or advice. I have been (occasionally) making barrel stave drums similar in style to Japanese taiko drums in Newcastle upon Tyne for the last thirty years or so. These are not precision instruments, and they get very rough treatment. The first ones I made were for a punk rock band, and in those days the only source I had for raw hide skins was to soak and unroll large dog chews. About 20 years ago I discovered an importer called Gold Coast Drums on the internet, and I bought heavy cow and bull hide skins from him. 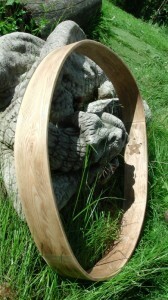 I made a few drums every year, usually for play groups and learning disability sessions. The head diameter varied between 12 and 36 inches with an extra couple of inches required to turn them over and nail them in place with upholstery tacks. They get beaten hard, with anything from cut down broom shanks to old chair legs, but I still have three drums that I have kept, and which have survived this kind of abuse for 10 years or more (in one case a lot more). After a break of a few years I have just been asked to make, nine or ten more drums, and I find Gold coast drums is no longer around. A quick trawl on the internet has revealed a few new London outlets, but they only seem to offer calf and goat skins, which would probably not cope with the kind of usage my groups hand out. do you know anyone able to supply skins in the smaller quantities that I require, about 2 square metres, or one full hide at a time? I need skins which are thick (my best ones are over 2.5mm), and that have not been tanned to leather, so that when I stretch them over a frame they will shrink and set rock hard. 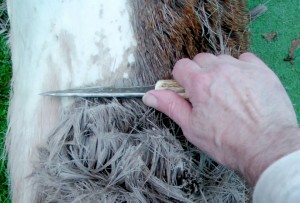 I am familiar with dealing with hair and flesh residue, and also with cutting wet hide to size with shears, so I do not need them in a fully prepared state. I would welcome any advice you are able to offer.